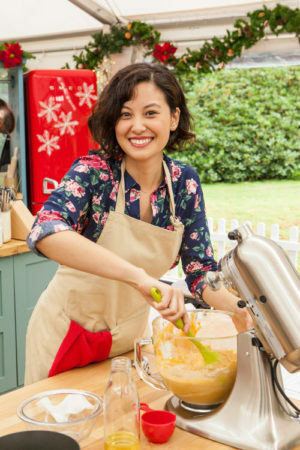 Stephanie Chen brought black sesame macarons, curry puffs and a pineapple bread Santa to the third iteration of “The Great American Baking Show” this year – dazzling celebrity pastry chef Johnny Iuzzini and British cookbook author Mary Berry with her bold flavors and knack for decoration. Even though the freelance advertising executive only started seriously baking about five years ago, Chen made it all the way to the finale and nearly took home the title. She shared her experiences on the show, her love of baking and even some yummy recipes with TaiwaneseAmerican.org. Enjoy! Karen Shih: How did you get into baking? Stephanie Chen: I’ve always had a love of sweets. I didn’t grow up baking at all, but when I started working in advertising, baking became this creative and emotional outlet. I managed a big team of people and I loved bringing in baked goods for them. I would bake a cake for each person’s birthday until the team got too big. What really propelled me to start baking seriously was my husband. He purchased a KitchenAid stand mixer for Christmas about five years ago. Before that, I just kind of dabbled in baking here and there. The minute he got me that mixer, it propelled my whole world and passion around it. K: Why do you incorporate Taiwanese and Chinese influences into your bakes? S: My parents were born in Taiwan and our family is originally from all different places in China. When my family immigrated over, they first landed in New Jersey. They opened a Chinese restaurant where my grandma was the cook, my mom would run the register and wrap dumplings at night and my uncle would run food deliveries. As a kid growing up outside of L.A., I used to go to the local Chinese bakery. I loved how everything was within arm’s reach and individually packaged. My parents would let me run wild in the bakery – my favorite was the pineapple buns. I grew up eating tons of Chinese desserts. That’s where a lot of my palate was developed. I really wanted to bring that heritage to the forefront. I saw the show as a really good opportunity to show America what a Chinese-American kid could really bring in terms of flavor. K: Why did you want to be on “The Great American Baking Show”? S: I was always a fan of “The Great British Bake Off.” When I’d watch and I’d think, “There’s no way I could ever do that! Everyone looks so good!” But when I heard they were doing another season of the American show, I took a chance and applied. I had quit my full-time corporate job about a year before that. It was really demanding – I managed a ton of different brands, including running iPhone advertising worldwide, and I just had an existential crisis. I was like, “I don’t know what I’m doing with my life!” I felt like I could do something more fulfilling. I started freelancing and working for some foundations and doing social impact work. I have better work-life balance now, so it’s given me the freedom to explore baking and get me to where I am today. I’m used to crazy deadlines and insane demanding people, so a lot of my early advertising days helped me prepare for the stress of being in the “Baking Show” tent. K: How did you prepare for the show? S: When I found out I was accepted, after a months-long interview and audition process, I was so excited but also really scared. You immediately go to your most vulnerable place and you think you’re not good enough and that you’re going to be scrutinized. Then I had to get to work practicing, because for me, the majority of the stuff on the show was stuff I’d never really made before. I’d done cakes and pies and cookies and bread, but the rest of it, I had to learn. I wasn’t doing anything except for sleeping and baking and eating for a long time. K: What was filming like? S: In the British version, they film in the weekends and the contestants get to go home during the week to their families. For us, it was all in one go, and they flew us out to the U.K. You saw all the bakers get so close to each other because we were all away from our family and friends and we only had each other. We called our family members but we all became each other’s support system. We would film a couple days, then be down a day, but we didn’t have much downtime. It was a really intense schedule, because you have to adjust to the time difference and not sleeping in your own bed and not being able to practice. I’d sit in my room and mime all my bakes, from making the custard to kneading the dough and putting it all together. They really structure the show brilliantly because it tests your knowledge and your instincts for what things need to look like and taste like. What I really enjoyed about this is unlike a lot of the other reality shows, this was so positive. It was really about you doing your personal best. The judges were critical but also very constructive. It’s so rare you’ll get nothing but positivity out of a television show. I think because of that, it also encourages people who are watching and baking to be positive and full of love in their lives. 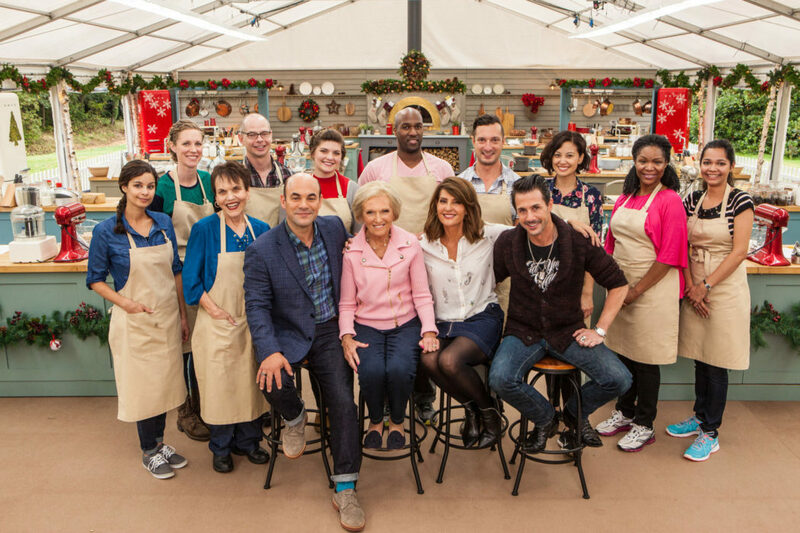 K: What was it like to have legends like Johnny Iuzzini and Mary Berry judging your bakes? S: It was really great to meet them. The feedback I consistently got from them was that my flavors were well-developed and always came through. When I feed my husband everything tastes good, so I loved hearing that from them! On the days after we filmed the technical challenges [when contestants are given a recipe they’ve never seen before to bake], Johnny would talk to us through the process. We could ask him, “What did you mean when you said make a parchment cone? What does a pate a choux look like?” It was invaluable time and advice we could get from him. K: What was your favorite challenge? S: That would have to be either the stollen from the technical or my surfing Santa for the showstopper. I love making cakes, so that’s why I’m more biased. I’d never heard of the stollen or seen it and couldn’t even imagine what it was. Bread with marzipan in it? You don’t see that in a Chinese bakery! It was one of those moments where my instincts told me how it should look and how it should feel and when to take it out of the oven. You had to trust your gut and for me, it paid off because I won that technical. For the surfing Santa, I just loved the design! It reminded me of being at home. K: What was the hardest challenge? S: Before I learned how to do it, I was dreading chocolate. It’s so temperamental. Johnny even said at one point, “Don’t turn your back on chocolate because it will turn its back on you.” You have to be a master of knowing consistencies and temperatures and how the crystals are forming. You then add the environment of being outside under a tent and not having a controlled, air-conditioned kitchen. I just managed to perfect tempering before going out there, which was such a great moment. But it was terrifying not to know what the weather was going to be. For my bread showstopper, I ended up with a drunk-looking super-sized Santa. The environmental factors had a huge impact and I couldn’t get my Santa to stay upright. I actually used a pineapple bun recipe in that challenge and I said when they came around, “This is a bread I grew up eating. It’s called bo-lo mian bao, it’s a coconut topping on top of milky bread.” But they cut it out! K: Now that the show is over, what are your plans? S: My friends and family are contacting me to do a lot of commissions, so that’s keeping me pretty busy. I started a baking blog so I can start cataloging the things I make and turn them into recipes for other people. I’m getting involved with a few charity projects, and I’m also trying to get my business license set up. I’m looking at being a supplier rather than having my own storefront. I can’t say too much about it right now, but I’m hoping to come up with a product I can sell, perhaps through coffee shops. K: Any advice for new bakers out there? S: I think the best way to start out is with something simple, like a cake or a cookie recipe. I love oil-based cakes or something timeless and delicious like a chocolate chip cookie. Those are the most fun in my opinion. They’re less about the science of everything. 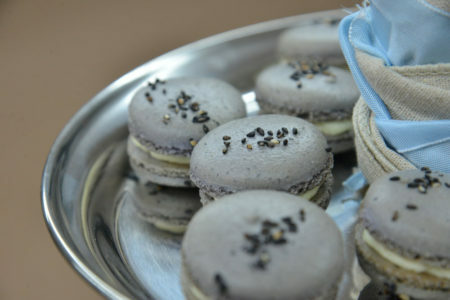 If you’re into the science part of it, go for a meringue or a macaron. 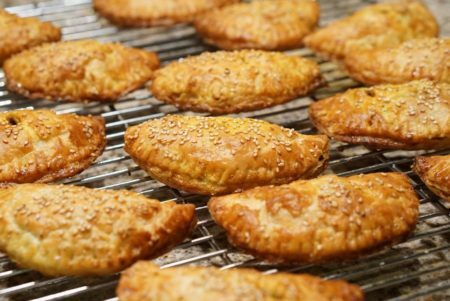 On my blog, check out the curry puff. It’s pretty easy! Someone also made it and they sent me a photo, which was so sweet. I love when people send me photos, because it’s like, “Oh my gosh, they get to eat it too!” On the sweet side, try the cherry corn cookie. People have sent me great photos of that too. K: Thank you for your time today!